It’s Thursday, and I do have a new “face of the day” post this week! How is everyone’s October going so far? I’ve mostly been hanging out with my kids, and I wouldn’t have it any other way. Most of the fall festivals don’t start for another couple of weeks in my city. Anyway, today I wanted to share another smokey eye that doesn’t require winged liner with a dark lip. These looks surprisingly don’t take long, and it’s probably because I delete 30 mins of crying over my eyeliner. However, I do have lashes on. I feel it’s a nice touch to any smokey eye. Concealer: Nyx Cosmetics HD concealer in Porcelain and Lavender. Set with Physicians Formula Correcting Powder in Translucent. Blush: City Color Cosmetics Matte Blush in “Blackberry.” I do have a coupon code, if you enter “Lunafayebeauty” on citycolorcosmetics.com you can save 10%. I love these matte blushes though. Very pigmented, easy to blend, affordable, and they last a long time on my cheeks. Brows: Nyx brow gel in “Black” and Hard Candy’s Brows now duo in Medium/Dark. On my lid: I took out my Too Faced Chocolate Bar today since it’s one of my favorite neutral palettes. I used Salted Caramel as my transition shade and then put Milk chocolate on the crease as well. On my entire lid I put semi sweet down with a flat brush. 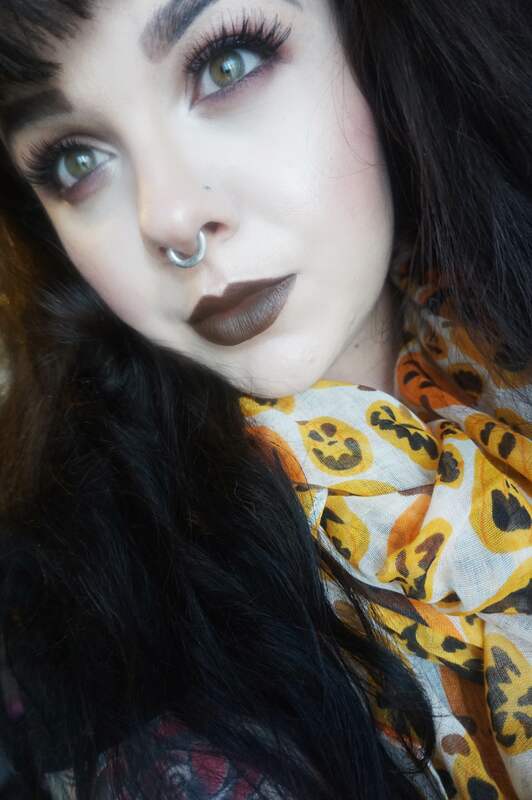 I then took “Central Perk” by Colourpop and put that on the outside. You could easily use Cherry Cordial, but I am obsessed with Central perk at the moment. I then smudged ‘Straight Trippin” by Colourpop on the lash line and applied my favorite Kiss #11 lashes. Lower lash line: liner is Nyx’s tres jolie pencil in black. I smudged Central Perk, Semi sweet, and Salted Caramel on the lash line. Mascara is Maybelline’s Lash Sensational. Inner corner highlight is Champagne Truffle from the Chocolate Bar palette. 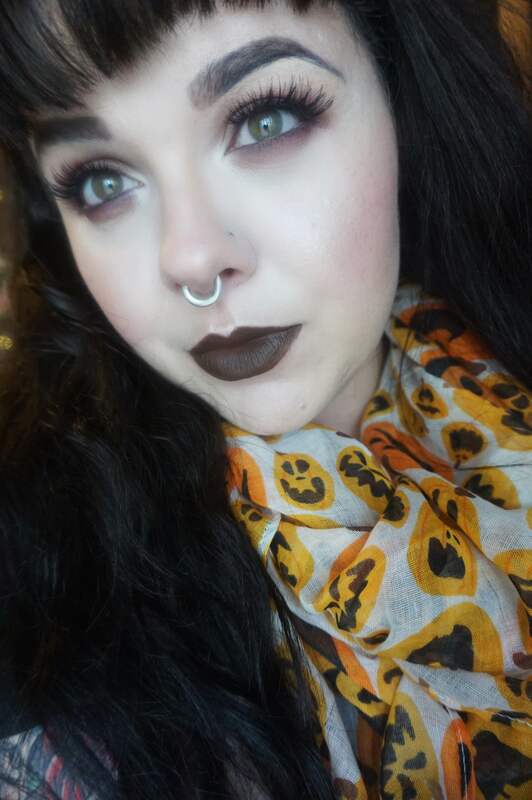 Lips: Necromancy Cosmetic’s “Oh No, Nancy.” I went back and forth about getting Melt Cosmetics’ “Catsuit,” but saw this one named after The Craft and bought it instead. I am not disappointed in this purchase either. This formula went on very smooth, yet remained very matte. I’m in love with it so far, and I may be getting a few more shades from their “We are the Weirdos” collection. I mean, that collection was named after me. It took me about 2 passes on the lips to get the pigmentation I wanted, which isn’t unusual for a very matte formula. Scarf: This was a Ross find that costed me a whopping $6! I love this scarf, it’s so adorable and I may wear it past Halloween. 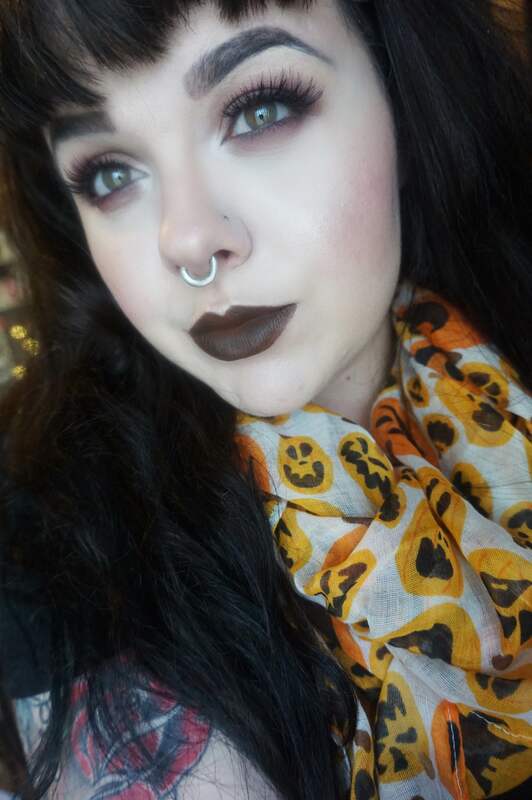 They actually had a few really cute Halloween scarves! That’s it for today’s Face of the Day post! 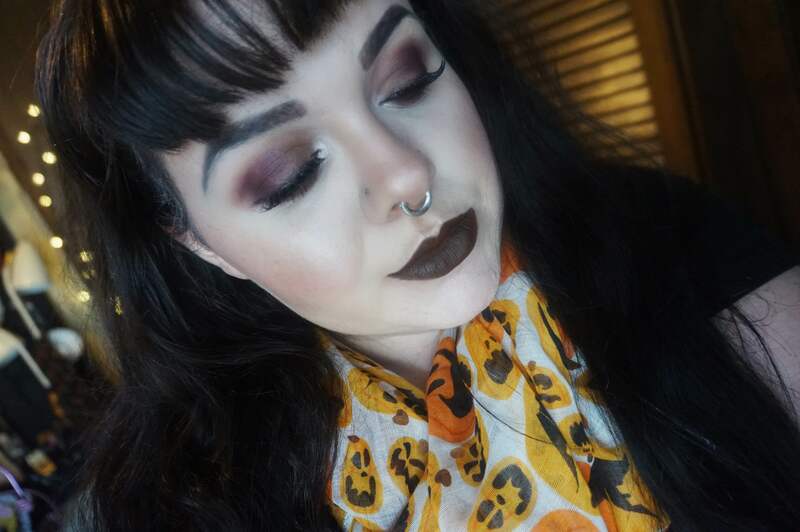 I hope you all are enjoying these Fall looks both on here and my youtube channel! I’ve had a blast creating them, that’s for sure. 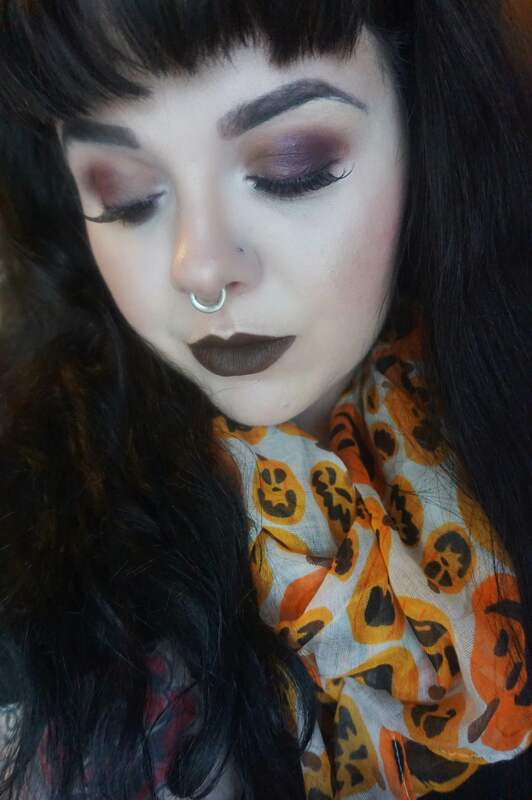 I love how much the cooler weather and darker shades inspire me. I hope you’re all having lovely days, and if you have any requests for future looks, let me know! Sometimes I find some really neat things in Ross! Usually the ones in my area are super picked through and I tend to find more things in Marshalls. Kohl’s has some really cute Halloween scarves as well 🙂 You should make a colourpop order! I have a feeling you would love their lippie sticks and highlights.